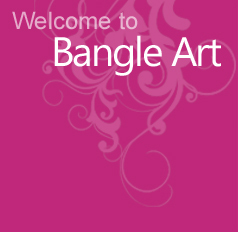 Fashion bangles really are Bangle art’s forte'. The range of styles and variations offered in this section will leave no woman without the perfect accessory for her casual or formal outfit. The entire selection ranges from sterling silver and costume pieces across the full spectrum of materials including metal pieces in gold or silver plating, wooden pieces with intricate designs or silk threading, fine enamel work, and much more.